Swimm, Vincent, together with three Baxter Academy students, win the overnight IT competition. 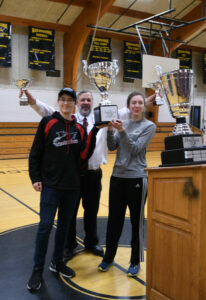 The Thomas Cup was presented to Maranacook Community High School students Anna Swimm and Vincent Bero at a school assembly on March 20. Thomas College professor and Thomas Cup organizer Dr. Frank Appunn presented the award at the high school in Readfield. The overnight IT competition is for high school students at Thomas College. Winners of the Thomas Cup 2018 were the two Maranacook students and three Baxter Academy students.